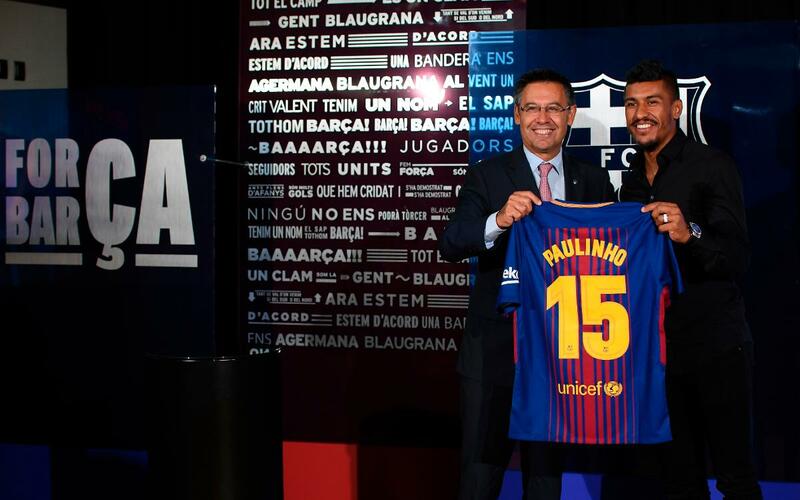 Paulinho will be the eighth Barcelona player and third Brazilian to wear the number 15 shirt, which wasn't in use last season. New signing Paulinho will wear the number 15 shirt in his first season as a Blaugrana player. The shirt has been free since Marc Bartra departed the club last summer, having worn it for three seasons. Two other players in the club’s history have worn the shirt for at least three seasons; the last was Seydou Keita between 2008 and 2012, and before him the Brazilian Edmílson wore it from 2004 to 2008. Thus, Paulinho becomes the third Brazilian to wear the number 15 shirt, which was also worn from 2001 to 2003 by Fábio Rochemback. The first player to wear this shirt was Laurent Blanc back in the 1996/97 campaign, followed by his compatriot Christophe Dugarry, Phillip Cocu and Jari Litmanen, who all donned it for a single season. Born on 25 July 1988 in São Paulo in Brazil, José Paulo Bezerra Maciel Júnior, better known as Paulinho, is player who is stands out for being a powerful midfielder at 1.82m tall who can get into the box and can play anywhere in the middle of the park. The 29 year old has plenty of experience in the game in various continents. The midfielder made his professional debut at the 18 years of age with Lithuanian club Vilnius FC. He also spent time at Polish club Lodz before returning to Audax São in his home country where he had played as an U19. A year later he signed for Bragantino and his excellent season brought him to the attention of Corinthians where he played until 2013 and during his time with the club from São Paulo he also made his debut for the national time. Paulinho returned to Europe in 2013 with English club Tottenham Hotspur before signing for Chinese club Guangzhou in 2015. Paulinho is a fixture in the Brazilian national squad under coach Titi and has been one of the players who has featured most for the national team in recent years. The 29 year old made his debut for ‘la canarinha’ in 2011 and 41 caps to his name with 9 goals and was part of the squad that won the Confederations Cup in 2013. FC Barcelona and Guangzhou Evergrande have reached an agreement for the transfer of the player Paulinho Bezerra for 40 million euros. The new Barça player will sign for the next four seasons. The player’s buy out clause is set at 120 million euros.